Email Message: Please check out our site and let me know what you advise. I have gotten other recommendations and want to follow all of them but I do not have the time. While I want to help everyone, it’s important that I not provide information that I’d normally give to paying clients. However instead of providing specific information, I can give a general idea of what I review from the standpoint of a visitor to your website. And granted, I’m a visitor who knows more than your average visitor. Being I techie, I’ll get frustrated very quickly if you’ve got broken links on your website. Does the link open in a new window or do I have to press the back button to get back to your website. Recently, I went to a very popular blogger’s website and clicked on the social media links. It took me to a page where I couldn’t like the page and I was a bit confused. Since I was on Facebook as my own page, I switched to my personal profile and figured out why I couldn’t ‘Like’ the page. It was a personal profile and not a business page…ummm. Best to use a Facebook page because you don’t have to approve everyone who wants to connect with you. What a hassle that would be if 10s of thousands decided to send a friend request at once. Something else I’m looking for is what your website is all about. If it’s not clear that’s a big problem. I’ve actually faced this on my own website where people are a bit confused about the services vs the training. This is something I’m working on behind the scenes to ensure there’s no confusion. I do realize it may also depend on the person, however I want it to be clear that I provide services to online business owners and bloggers AND train other virtual assistants. It may take a while to get this crystal clear, however your website is always a work in progress. In addition to understanding what your website is all about, I’m also looking for you. I like to see a picture of the person who is speaking to me on the website. If there’s no picture it feels cold and awkward. If I don’t see you right away on the homepage, I’m then heading to your about page. And if you’re not there, I’m out. No picture, no connection. 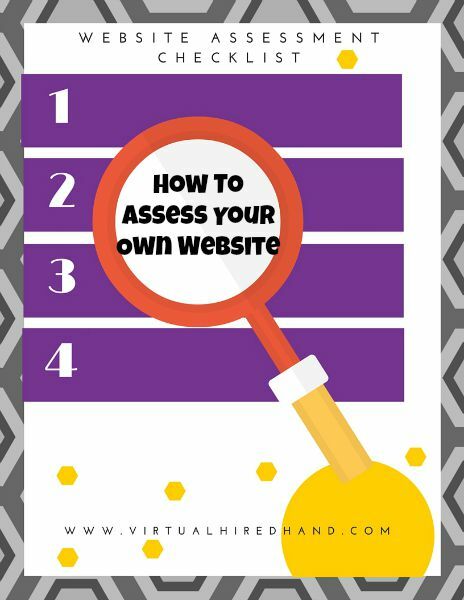 I created this fun checklist to help you assess your own website. If any of this applies to you, it’s time to make some changes. Click to download the PDF! 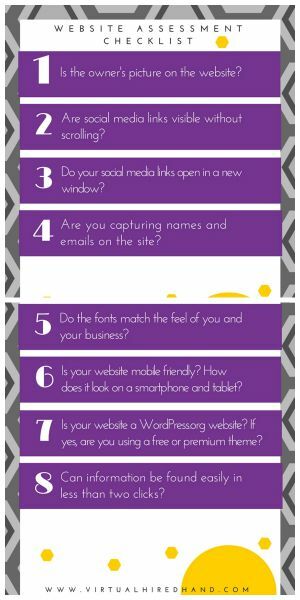 This is a starter list based on what’s visible on your website. Imagine what you can’t see?! Founder and Chief Techie/Strategist of Virtual Hired Hand serving clients since 2008. 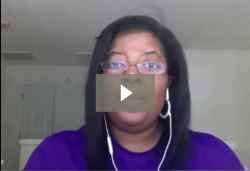 I show clients how to utilize their Website, Webinars, and Facebook to get their message online. I also coach those interested in providing services to clients from the comforts of home. Free VIDEO Guide + Transcription! Get immediate access to the training, worksheet, and transcript!